For this report we grouped countries into three economic categories: “advanced,” “emerging” and “developing.” These categories are fairly common in specialized and popular discussions and are helpful for analyzing how public attitudes vary with economic circumstances. However, no single, agreed upon scheme exists for placing countries into these three categories. For example, even the World Bank and International Monetary Fund do not always agree on how to categorize economies. In creating our economic classification of the 39 countries in our survey, we relied on multiple sources and criteria. Specifically, we were guided by: World Bank income classifications; classifications of emerging markets by other multinational organizations, such as the International Monetary Fund; per capita gross domestic product (GDP); total size of the country’s economy, as measured by GDP; and average GDP growth rate between 2010 and 2015. Below is a table that outlines the countries that fall into each of the three categories. 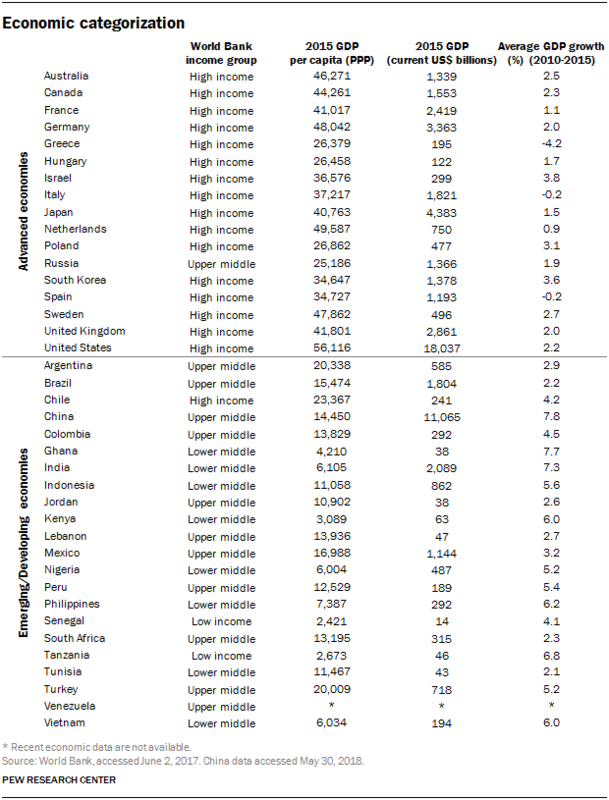 The table includes for each country the World Bank income classification, the 2015 GDP per capita based on purchasing power parity (PPP) in current prices, the 2015 GDP in current U.S. dollars and the average GDP growth rate between 2010 and 2015.